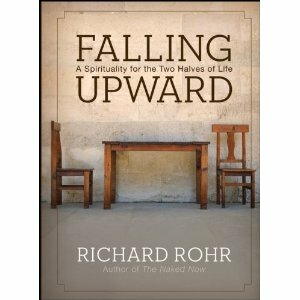 Falling Upward: A Spirituality for the Two Halves of Life by Richard Rohr, Jossey-Bass, 2011, 200 pp. It’s difficult to write a review of this book. I was drawn to it, and the Spirit spoke to me through it in some powerful ways. At the same time, I found myself with some large disagreements with the premises and arguments it contains. Rohr describes the spiritual life in two halves. The first half is about building the container that gives shape to your life–your persona, your career, your family, your identity. The second half of life is about the contents of that vessel, the true stuff of life that can be contained by it. However, he argues, you can only begin to address these second half of life concerns when the vessel begins to fall apart, or at least when you stop believing in the container as your true self and source of strength. He uses the example of Odysseus, who spent 20 years on his famous journey trying to get home. It was a first half of life journey, with conquest and titles and power. But The Odyssey doesn’t end there. In the final two chapters, Odysseus must undertake another journey, which involves traveling inland and letting go of his oar, the tool that delivered him safely home. This was a second half of life journey, a letting go which finally allows him to rest at home. I connected with Rohr’s work because I am finding myself moving into a different phase of my life. I will be 40 in less than a year. My family and career choices are fairly well settled, and I am happy with both. Yet precisely because so much is now settled, it also feels like there is a new opening in my life, and a desire to live differently and more deeply. Rohr’s book offered several helpful guideposts that pointed me in the right direction for this journey. In his chapter on the first half of life, he identifies the importance of strong forces to push up against. Rohr’s construction reminded me of Freud’s superego, which holds the law for us. We must eventually move beyond it, but it is an important ingredient in our development. Given that so many people are still in the first half of life journey, it made me ponder the role I play as a pastor. Many people look to me to act as their superego or lawgiver. It is a role I am reluctant to assume, because I generally see more gray than black-and-white. However, I wonder if I need to find ways to be more strident in my nay-saying to the destructive forces around us, and give more structure and form to the faith I teach and preach. It is not an encouragement to me to be more black-and-white, but to be bolder in proclaiming right from wrong, even in the face of resistance. As he begins to address the second half of life journey, Rohr’s various chapters gave me language to talk about many of the concerns that have been on my heart. The Tragic Sense of Life: Life does not move forward in an orderly straight line of progress, but constantly wrestles with sin, failure, tragedy and hardship. Necessary Suffering: Incarnation leads to suffering. It is all around us, built into creation. Resurrection requires a dying. The Shadowlands: The persona we create in the first half of life comes with a shadow, that which we try to hide or dismiss. The second half of life requires us to acknowledge and confront this shadow side to ourselves, which always humbles us. I resonated deeply with many of these realities and concerns, and recognized my own need to engage in this kind of spiritual work at this point of my life. In spite of its helpfulness to me, I also hold some profound arguments with Rohr’s construction. First and foremost, it is very masculine in its orientation. The model of leaving home, conquering and returning is rooted in the masculine hero myth, and women’s journeys can take a very different path. Similarly, Rohr seems to insist that some crisis, failure or falling apart is required to launch the second half of life journey. While I do agree that something must be shaken or cracked in the steady persona in order to launch that journey, I do not think an earth-shattering crisis is a necessary condition for advanced spiritual development. Yes, one must integrate suffering and hardship and tragedy into a sophisticated spiritual life. Yes, one must let go of the relentless pursuit of status and certainty to reach the second stage of the journey. However, I believe that process may not be a single, shattering earthquake. It may be more like a snake shedding its skin—over and over again, as seasons change, we are required to let go of the old in order to grow into the new. It is painful and uncomfortable and ugly to look at, but in the end we are made new. Not once, but many times throughout our lives. Rohr’s Falling Upward was not unproblematic, but it was also not unhelpful. I recommend it (with the arguments above) to anyone who feels a sense of restlessness even as they should be settling in to the life they have created, to anyone who is interested an a deeper journey, to anyone contemplating mid-life and beyond. 4 Responses to "Book Review: Falling Upward"
Thanks for the thoughtful review of a book I’ll probably not read, but with which I can resonate on a number of subjects. The theme of “home and homesickness” is one that comes up a lot in my writings and my reflections of the writings of others. You might want to check out a review I just posted of a good new memoir – “Entering the Blue Stone” (I also have a post interviewing the author). While not told from a Christian worldview, it is a well written book about the many crises we face as our parents grow older and die. Thanks for the recommendation, Tony! I’ll have to check it out. I know so many people coping with the challenges of aging parents. Thanks for this review! I’m not sure when (or if) I’ll get around to reading this, so I appreciate you pulling out some highlights for me.